Burying our loved ones is a part of life that we don’t want to think about. The process of purchasing plots and caskets has been the standard tradition for years because of this. 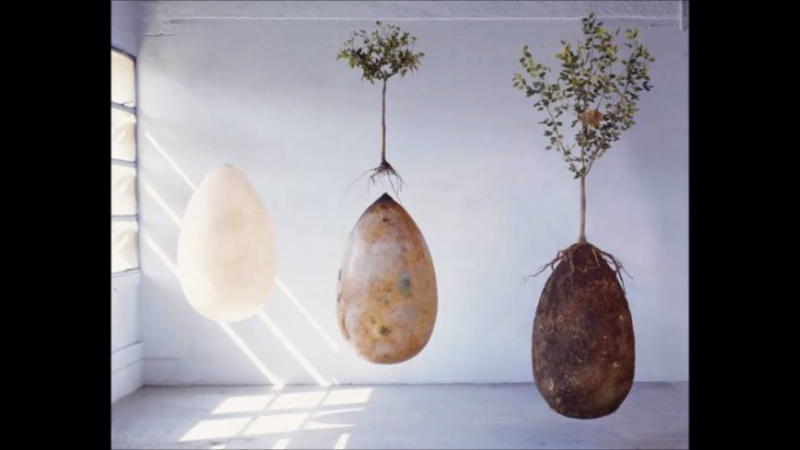 However, there’s good reason to upgrade from the norm, and a few Italian-based designers have found a way to make burials more environmentally friendly. Raoul Bretzel and Anna Citelli have created the Capsula Mundi, which is also known as “world’s capsule” in Latin. It’s an egg-shaped casket that can fit either bodies or ashes inside of it, and it can break down much easier than traditional wooden coffins. Instead of tombstones sitting in the ground above, trees would be planted. The idea behind the trees is two-fold. It represents an afterlife for the person being buried. As the body decomposes or the ashes spread, the tree will grow. This process would also be giving us more trees in our environment. An associate professor at Tennessee, Jennifer DeBruyen, told CNN about how going green in the burial process would be a major improvement. DeBruyen explains, "The problem with traditional burials is that they're completely anaerobic. The remains are buried deep and sealed in a coffin. There's a lot of incomplete degradation." Since the Capsula Mundi is a biodegradable casket, 100 percent of the product would eventually be gone and wouldn’t be polluting the Earth. These nutrients would also aid in the growing of these trees, although there’s debate on how big the tree initially should be. Some scientists believe having a bigger tree from the start would sap up the nutrients quicker. If not, groundwater would be affected. When stepping back to think about it, there is a lot of waste when it comes to producing coffins and tombstones. These products are something we see only briefly, and going green would also give the added benefit of keeping costs down for the grieving families. An instant drawback would be the wild swing in tradition. While most of the process remains the same, it would be hard for some to change their ways. This process also wouldn’t work worldwide. While all of North America doesn’t have any governmental laws restricting burials, Italy wouldn’t allow this type of process. The Capsula Mundi is still in development, so early adopters would only be able to get the version that can contain ashes. At the moment, two variations of the casket can be purchased directly from the main site: sand and white. The latter costs about 380 Euro, or roughly $416 US, with the sand version costing about $50 more. According to the website, it can take anywhere from 10 to 60 days for the shipment of these caskets. The company’s goal is to eventually have enough plots to create a “sacred forest” for the deceased. Trees will be taken care of in similar fashion to how graveyard sites are managed, and while each tree won’t have a unique marking, there will be a GPS system in place to find the exact plots. For those that are interested in storing the casket, each come with a five-year guarantee and won’t break down until it hits soil.